Apple is not the only one that will rush into use the fingerprint recognition technology in its mobile devices. The upcoming HTS One Max is one that will rival the iPhone 5S as soon as it becomes available soon. It's good that your phone will finally be able to 'recognise' just yourself, the rightful owner, with a touch of your finger. The first 5.9-inch phablet with fingerprint recognition coming your way? Computerworld Malaysia showed a leaked photo of HTC's One Max phablet that has a fingerprint scanner on board. The leak via Android Community gives us the best glimpse of the One Max yet and it's complete with a fingerprint scanner to rival the iPhone 5S. 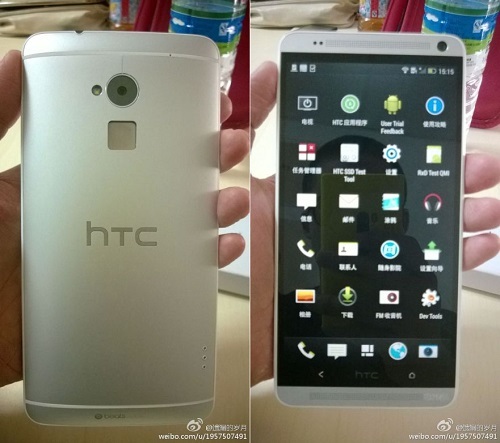 The HTC One Max, codenamed the T6, has been talked-about for a while with an alleged 5.9-inch screen. That would put it in competition with other phablet sized smartphones including the Samsung Galaxy Note 3 (5.7-inch) and Sony Xperia Z Ultra. Word has it that the HTC One Max would be powered by a 2.3 GHz Qualcomm Snapdragon 800 processor and 2 GB of RAM but the generally accurate evleaks says otherwise. Other specifications include 16 GB of internal storage, an Ultrapixel rear camera, a 2.1 Mp front camera and unlike other HTC One phones, a microSD card slot. HTC has plenty of competition from rivals including LG with its G2 and Apple with its iPhone 5S, but competition should be good from the perspective of the consumers. We shall see.